The rice terraces around Sa Pa in Vietnam have so far been spared from Western globalization. Visiting the minorities. Mama Lili picks a fern, tears a thread from her headscarf and winds the two leaves to the stalk. The bound fern is reminiscent of a heart. In broken English, she talks about her family. Take a short break before continuing uphill, past rice terraces, free-running water buffalo and pot-bellied pigs. Mama Lili, who looks much older than she actually is (mid-fifties), is step-by-step. The destination: the small village of Háo Thào near the mountain town of Sa Pa, where Mama Lili lives with her son, his wife and their five grandchildren. Sa Pa is located at 1,560 meters altitude in the province of Lao Cai near the Chinese border. The once so sleepy mountain town reminds little, the more tourists come, the more hotel complexes are built. 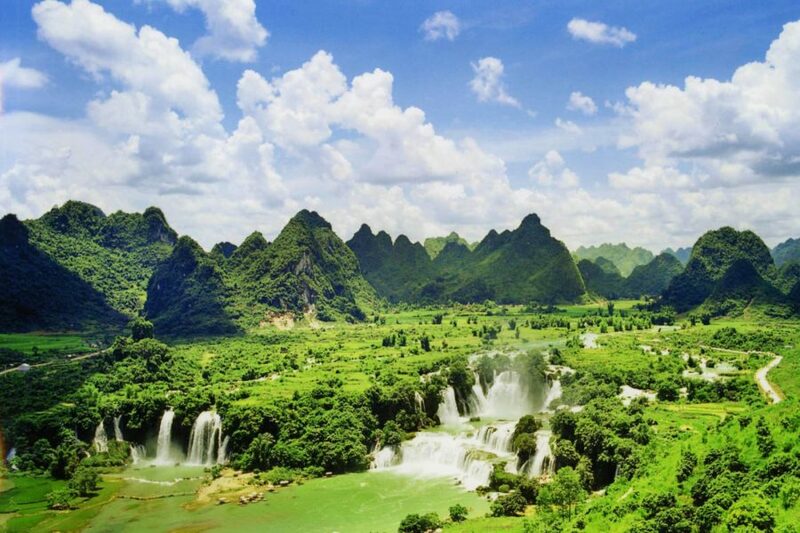 Ten kilometers away is Vietnam’s highest mountain, Fan Si Pan. If you want to conquer the top of the mountain at 3,143 meters, you can do it in stilettos and flip-flops – since 2016 there is a cable car up there. However, to immerse yourself in the picturesque natural scenery of North Vietnam and the original life of the local minority, you have to slip into the hiking boots, leave Sa Pa behind and follow Mama Lili in the rice terraces. 27 minor terraces the north of Vietnam. The tribes can be recognized by their clothes: The women of the Red Dao wear red scarves on their heads, the flowers Hmong can be recognized by their colorful robes. Mama Lili belongs to the tribe of the Black Hmong. They wear large, silver earrings and indigo robes that they dye themselves. The ascent from Sa Pa to Háo Thào lasts six hours. When visiting the villages empathy is required: Before photographing the minorities should ask for permission, there is the belief that their mind is captured by the snapshot. Buddhism, Shamanism, Ancestor Cult, and Confucianism – Vietnam is rich in co-existing religions and philosophies. Mama Lili’s village consists of scattered houses, there are no cars, but satellite dishes on the roofs. The confidence of the children is won with sweets brought before it goes back to play with knotted ropes, bicycle tires, and sticks. The older girls are looking at their smartphone. They do not speak English. How interesting would it be to know how much they get here from the globalized world out there. The wooden house that Mama Lili lives in with her family was rebuilt six years ago. “Since then we have gas and electricity,” she explains proudly. It is still cooked on the old hearth, washed off in a water hole on the kitchen floor. The windows have no glass. For dinner, the whole family gathers around a table on the typical Vietnamese plastic chairs. Rice, tofu in parade sauce, chicken with papaya, fried fish, spinach and rice wine are served. The host murmurs a quick prayer before the children rush to the food. Mama Lili looks attentively that everyone has something on their plate before she accesses herself. The shower can be accessed through the courtyard, but it will be omitted on this evening. The beds are hard, the sleep comes to sleep. “Breakfast”, Mom calls Lili the next morning, her R sounds like an L. For the guests there is probably the best banana pancakes instead of the traditional noodle soup. But maybe they only taste so good because of the breathtaking view that you get served: The early morning fog dissipates slowly and the green of the rice terrace s comes to the fore. Strengthened it goes back into the valley. On the way stop in the already more civilized villages Lao Chai and Tan Van. There is at least glass in the windows here. As a souvenir, an indigo-dyed upholstery cover is quickly taken along. He graces the couch at home. On the table in front of it is Mama Lily’s dried fern heart in the vase, a reminder of the otherwise different, magical world in the north of Vietnam. Traveling flights from Vienna to Hanoi only with a stopover. From Hanoi take the (night) train to Lao Cai, the remaining 38 km you take by bus or taxi back. At least as adventurous is the winding ride on the bus. Between seven and ten hours you are on the way. Best time to travel From March to May and from September to November when the weather is sunny and stable. Cold temperatures prevail from December to February and rainy season in summer. Food & beverage Do not be afraid of the food stalls: In Vietnam, you can eat excellent on the street. Raw vegetables, unpeeled fruit, and tap water should be avoided. Living Best with the locals, at Homestay Sapa, the Sapa accommodations can be booked online. Cost between ten and 15€ per night.